If you already have collected a large number of bookmarks, the chance is high that you have duplicated bookmarks. This new feature makes possible to find and delete the duplicates. The feature is accessible on the My Bookmarks page (only in desktop browser, not available in mobile browser). Make sure "All" is selected and no tag is selected from the Available tags list. This is the default state when you click on the "My Bookmarks" menu and the page loads. The "Find Duplicates" menu will be accessible only when the these conditions are met. Click on the "Find Duplicates" menu to bring up the "Find Duplicates" dialog. 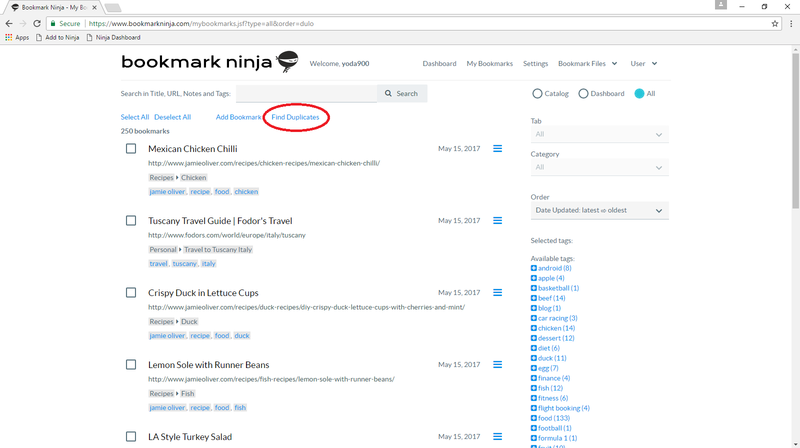 A bookmark is considered to be duplicated if it has the same URL as another bookmark. 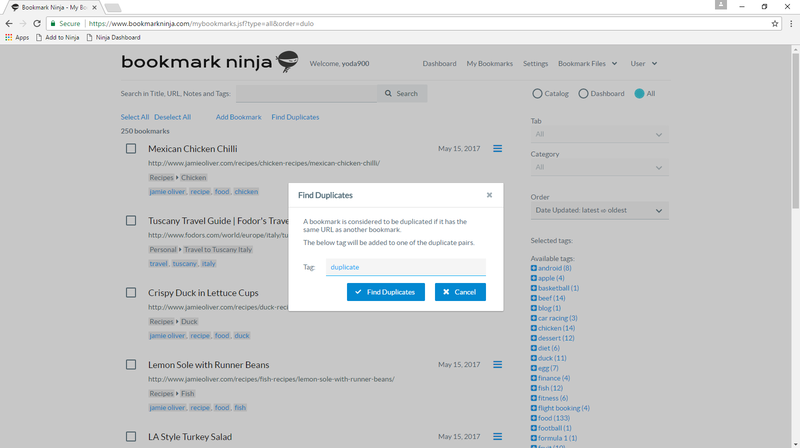 Enter a tag (default tag: "duplicate") that you want to add to one of each duplicate pairs. For example if 5 bookmarks have the same URL then the tag will be added to 4 of them. 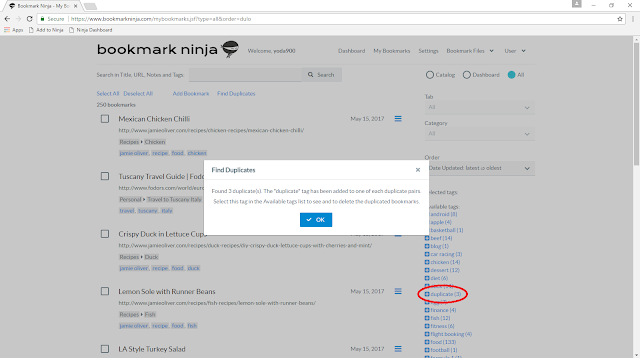 To start the search click on the "Find Duplicates" button. When the search is complete, click on OK to close the message box then click on the "Duplicate" tag in the Available tags list to see the duplicated bookmarks. Now select all the bookmarks (click on "Select All") and delete them (click on "Delete"). 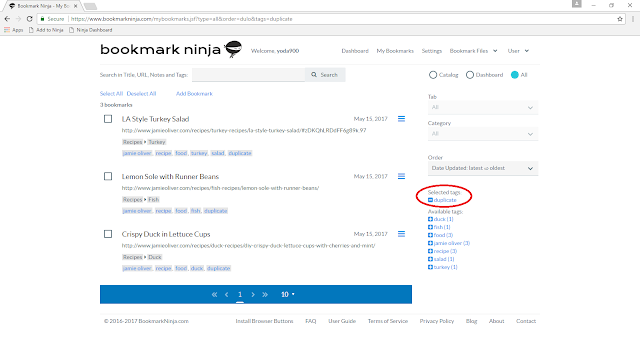 Before deleting the bookmarks always make sure that the "Duplicate" tag has been selected. Thank you for this very useful feature! One suggestion: I think, it's better to tag all the duplicates (in your example, 5 of 5, and not 4 of 5), because in this case a user can compare their locations (tabs and categories) and manually select for deletion specific bookmarks, or keep them all (sometimes it convenient to store the same bookmark in different categories). Thanks for your suggestion, you brought up a valid user scenario. I plan to improve this feature by adding an option so that the users can choose to mark "4 of 5" or "5 of 5" of the duplicated bookmarks. I would like to keep the current method (select "4 of 5"), too, because it's good for deleting your duplicates quickly without reviewing them. Thanks again! I just went thru this process and deleted the duplicates. Went back and searched for one of the bookmarks that I know was a duplicate and they are all gone. I thought it would leave one of the duplicates. Not happy about that.